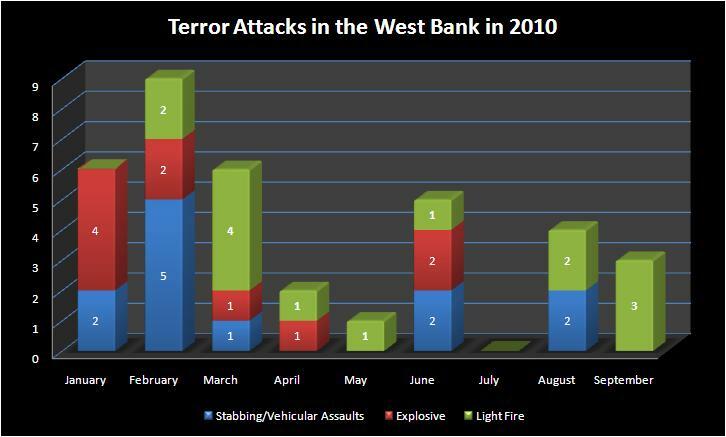 As of September 20th, 2010, there have been 36 terror attacks in the West Bank this year. In comparison to previous years, 2010 has been a relatively calm period for the residents of the West Bank as the number of terror attacks continues to drop. Terrorist activity in the West Bank (Central Command) decreased by 97% in 2009 compared to the recent peak year in 2002. These numbers have decreased every year since 2002, with the exception of 2006, the year of the Second Lebanon War. Significant reduction in terror activity occurred in the West Bank between the years 2002-2003, after Operation Defensive Shield, and again in 2007. When Hamas violently seized power in the Gaza Strip in the summer of 2007, the Palestinian Authority in the West Bank took measures to prevent a similar situation in the West Bank. The PA began to coordinate more closely with the IDF than before, and the number of terror attacks has decreased ever since. 2010 has been a relatively quiet year with the exception of the past few weeks when violence has flared up again, due to recent developments in the political realm. For the past several years, most terror attacks in the West Bank have been carried out by an isolated individual or individuals. In general these attacks have been characterized by ‘cold weapons’ (i.e. knives), light weapons fire, and/or vehicular assaults. Since the beginning of 2010, four civilians and two security force members have been killed in terrorist activities, and 54 security forces have been injured during operational activities in the West Bank. The four civilians – Yitzhak Aimes, 47, Talya Aimes, 45, Kochava Even-Chaim, 37, Avishai Shindler, 24 – were gunned-down near Kiriat Arba, south of Hebron on the evening of August 31st. Ihab Khatib, 28, an IDF Warrant Officer, was stabbed to death by a Palestinian man at the Tapuach junction on February 10th, and Yehoshua (Shuki) Sofer, 39, an Israeli police officer was shot and killed by a Hamas terrorist cell on June 14th. Many of the security force injuries were caused by rock hurling (carried out both by Palestinian and Jewish West Bank residents against the forces). One IDF soldier was injured in his face by a stun grenade thrown at him by a Palestinian on April 22nd. Also as of August 30th, during 2010, 40 Israeli civilians were injured in the West Bank during security related incidents. Included in the 40 injured are Jewish and Arab Israelis, and among them are also a number of children, and an infant. Most injuries were caused by rock hurling. Two injuries were caused on 1st September in a drive-by shooting near Rimonim. Also during this time period, 8 armed and violent individuals were killed, and 70 were injured. These individuals carried out or attempted to carry out terror attacks against civilians in the West Bank. Examples include attempted stabbing, live fire towards security forces, and attempted running over civilians/security forces with a motor vehicle. As a result of rock and firebomb hurling instances carried out both by Palestinians and settlers, 8 uninvolved Palestinian civilians and 2 uninvolved foreign citizens were injured. Until the Hamas terror attack near Hebron on August 31st which killed 4 Israeli civilians, there had been no civilian casualties in security related incidents in the West Bank (Central Command area) in the year 2010. 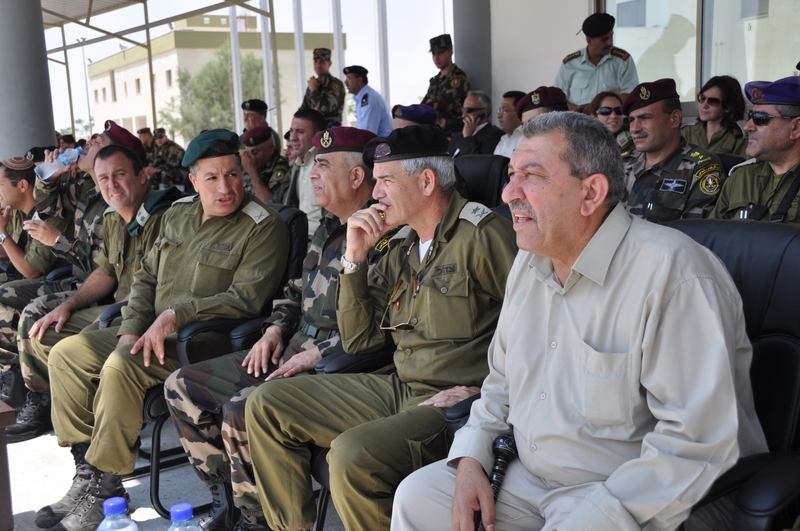 Despite the recent resurgence of violence, the IDF will continue to work in conjunction with the Palestinian Security Forces in the West Bank in order to maintain stability in the region for both parties.